Stonehaven has a fascinating, long and enduring history. The town is inescapably bound up with the cliffs and waves of the North sea. The original settlement of the town called it, Kilwhang. ‘Kil’ was the word for hill, while ‘whang’ evoked the sounds of the wind and waves hitting the cliffs. The settlement was first established in Stonehaven during the Iron Age. The town sits just south of the ancient path, Causey Mounth trackway, that connected the city of Aberdeen to the northern coastline. This route holds an important place in Scottish folklore, as the track taken by the Earl Marischal and his army to fight during the English Civil War. The buildings of Stonehaven contain traces of history of the town. These notably include the Dunnottar Castle, Dunnottar Church and the Stonehaven Tolbooth, former prison and court. All of the buildings are open to visitors throughout the year. 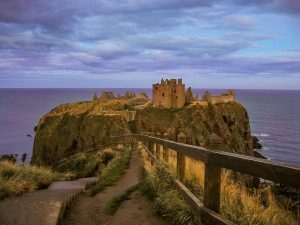 The Dunnottar Castle has played a key role in the many historical events of the land. During the Scottish Wars of Independence and the English Civil War, the castle protected the Scottish Crown Jewels. While Oliver Cromwell attacked and his armies attacked the fortress over a period of eight months, the castle stayed strong. And when eventually they could hold off Cromwell’s forces no more, rather than give up the Honours of Scotland, as they have come to be known, they crown jewels were incredibly sneaked out of the castle by a few ladies. They were subsequently taken to a nearby village, whereby they hidden for up to 11 years. The castle was temporarily occupied by Kind Edward I of England until it was reclaimed by William Wallace, the character of Braveheart. In fact, reports from the time claim that the Scottish hero burned English prisoners in the castle. The town was a Jacobite town during the French revolution of the 18th century. As the Jacobite armies retreated from the battles in France, Stonehaven would act as a safe haven in 1716. The fishing village of Cowie Bridge, which was previously a distinct place, has since become part of the town and Stonehaven now boasts a population of almost 12,000 people.